Like many others I received an e-reader as a Christmas gift. Despite loving technology I have clung to my love of paper books and in all honesty if my partner hadn’t bought me a Kobo Touch I would probably still be buying (and not knowing where to store) an abundance of traditional books. However, since I now have the digital toy I’ve resolved to read at least every other book on the Kobo. The ability to highlight, bookmark passages, and take digital notes is a huge asset for academic reading. This advantage is the same one that prompts my use of Zotero to keep track of citations and reading notes on my laptop. The dictionary feature is my new best friend. These are all great reasons to use an E-reader or tablet, however digital texts haven’t really advanced traditional reading in any profound way. Ebooks are essentially digital copies of paper books. Given the push for digital interaction, I find it a bit surprising that more innovation hasn’t occurred in the development of multimedia and expanded digital texts. The one example I have come across that pushes the boundaries of e-publishing is Paul La Farge’s Luminous Airplanes work. La Farge describes his work as “immersive text”, something akin to a new phase of hyperlink books which allows the reader to explore a text in unique and exploratory ways. A recent Spark interview highlights the ideas behind La Farge’s work. Additionally, Apple just announced the introduction of iBooks 2 app which boasts an interactive textbook format. It will be interesting to see if Apple’s idea catches on and how it actually works as an interactive medium. What types of innovation in digital literature would you like to see? The latest issue of the American Archivist (Volume 75, Issue 2) featured an article by Paul Conway and William E. Landis titled, “Open-Access Publishing and the Transformation of the American Archivist Online.” This article provides an interesting examination of recent trends within the Society of American Archivists (SAA) and current thoughts regarding open-access and digital publishing. Conway and Landis maintain that the SAA has adopted a form of open-access publishing that is a middle ground between completely open access and a pay per use model. This is seen in the assertion that, “all older content is freely available online and represents and unambiguous commitment by SAA to the widest possible dissemination of journal content over time,” while newer (most recent six issues) American Archivist content is restricted to SAA members or those who pay for access. This seems like a decent compromise, by still providing all other content to the general publish while maintaining an increased level of content for those who purchase an SAA membership. However, Conway and Landis astutely point out that this membership or pay wall limits access to the newest scholarship and may leave smaller community archives and professionals outside of the archival field behind. Given, the American Archivist‘s current state of straddling both paper and digital worlds it seems as though there are a number of accessibility concerns that will have to be addressed in the long run. Additionally, the concern over the lag time of paper journals – eg. the American Archivist only publishes twice a year, making it a poor venue for time sensitive discussions – is well broached in this article. The SAA’s new online review portal has begun to address this concern and provide information that is available only in digital form. 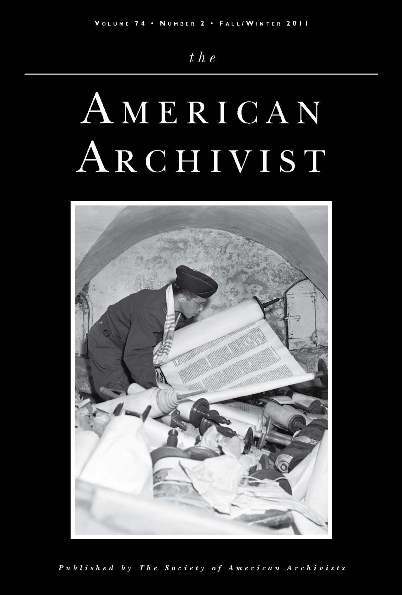 The examination of the American Archivist by Conway and Landis is one of many recent works focusing on the need to bridge the divide between scholarly publication and open access digital publication. Initiatives such as Digital Humanities Now, and media-commons projects are excellent examples of scholarly communities attempting new forms of scholarly digital communication. New alternatives and forms of communication are developing all the time and the archival community has just begun to look into the possibilities offered by digital publication.